In this video, we will discuss, how to check/uncheck all checkboxes with another single checkbox using jquery in an asp.net mvc application. Please watch Part 65, before proceeding. 1. When the checkbox in the header is selected, all the checkboxes in the respective rows should be selected. If we deselect any of the checkbox, then the header checkbox should be automatically deselected. 2. When the checkbox in the header is deselected, all the checkboxes in the respective rows should be deselected as well. If we start to select each checkbox in the datarows, and upon selecting checkboxes in all the datarows, the checkbox in the header should be selected. 3. We also need a client side confirmation, on the number of rows to be deleted. 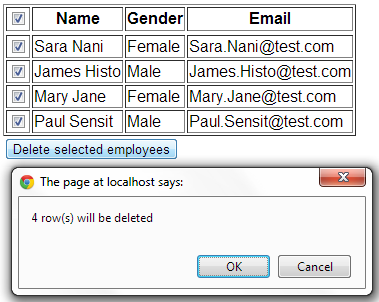 The selected rows should be deleted from the database table, only when OK button is clicked. If cancel button is clicked, the form should not be posted to the server, and no rows should be deleted. Here's the required jQuery script. Please paste this in the "Index.cshtml" view. jquery not working as expected when referring to CDN. check unchecked more then one time its wont work with CDM. with script folder its working proper not able to find why. The .prop() function works for me and i also replace removeAttr with removeProp(). This is a great video, i personally had this requirement. It would be really helpful if you could make a video series on JQuery.